M. Antoni J. Ucerler, S.J., "Christian Encounters with Early Modern East Asia: Lessons in Cultural Accommodation and Dialogue"
The Mario Einaudi Center for International Studies and Cornell United Religious Work kick off their new series, Faith, Hope, and Knowledge: Interfaith Dialogues for Global Justice and Peace, with a talk by Fr. M. Antoni J. Ucerler, S.J., director and associate professor at the Ricci Institute for Chinese-Western Cultural History at the University of San Francisco and fellow of East Asian studies at Campion Hall, University of Oxford. Ucerler received his doctorate from the University of Oxford and his Bachelor of Sacred Theology from the Gregorian University in Rome. 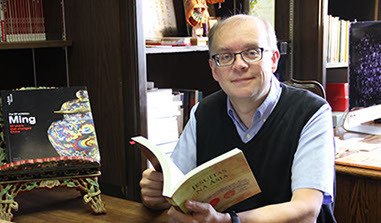 His academic focus is on the relationship between Europe and East Asia in the sixteenth and seventeenth centuries with emphasis on Christianity in Japan and comparative studies of the Jesuit mission in Japan and China. He has authored and edited multiple works, including Christianity and Cultures: Japan & China in Comparison, 1543–1644 (2009) and Legacies of the Book: Early Modern Printing and the Visual Arts in Asia and the Americas (Leiden: Brill, forthcoming). The Faith, Hope, and Knowledge series is supported by funds from the Office of the Vice Provost for International Affairs as part of its strategic priority to promote global-at-home learning. This event is cosponsored by the East Asia Program.